Good location. 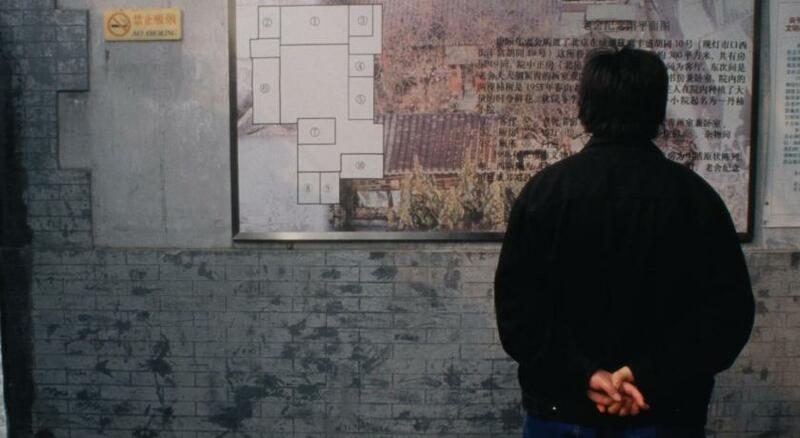 Right by the popular Wangfujing street, forbidden city, and other hot spots. The staff was amazing, and very helpful. Big hotel and has a great lobby. At the wangfujing st. Neat to shopping malls. The beds look so old but little bit conformity. Nice breakfast. Good staff. Friendly and helpful at checkin. Not so much on checkout. Good area. Hotel staff was really helpful. Proximity to Wangfujing and Forbidden City areas is a big plus point. The concierge helped arrange our great wall transport and Forbidden City tickets for a bit extra charge but it was worth the convenience. Room this time was better than my previous stay in the same hotel. Lobby with piano bar. Excellent location, good value, Clean. As a vegetarian I was happy with Veg options they had in breakfast. One of our top picks in Beijing.Crowne Plaza Beijing Wangfujing is centrally located along the popular shopping belt of Wangfujing Avenue, around a 10-minute drive from Tiananmen Square and Lama Temple. The hotel offers an indoor pool, 3 dining options and a spa. Beihai Park is around an 8-minute drive away and Houhai bar area is around a 20-minute drive away. Crowne Plaza Beijing Wangfujing is around a 15-minute walk from Wangfujing subway station (line 1) and around 1.2 mi from The Forbidden City. Beijing International Airport is around a 45-minute drive away and Beijing Railway Station is around a 15-minute drive away. 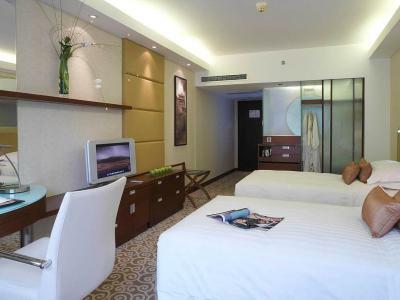 The contemporary and elegant air-conditioned rooms are equipped with a LCD TV, a work area and a mini-bar. 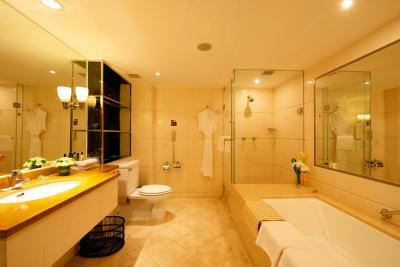 The marble bathroom comes with bathtub and shower facilities. The hotel’s spa offers massage services and a hot tub. Guests can work out at the fitness center, enjoy karaoke, or make use of the banquet hall or meeting rooms. Ticketing services and tourist information are available at the tour desk. When would you like to stay at Crowne Plaza Beijing Wangfujing? Air-conditioned room with a king double bed, a flat-screen satellite TV and a minibar. Public parking is available on site (reservation is not needed) and costs CNY 112 per day. 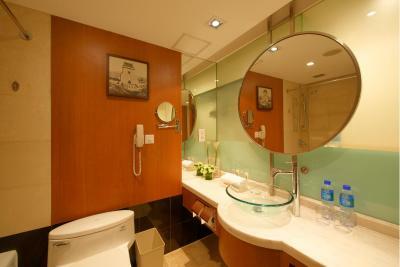 Spacious room including a marble bathroom with bathtub, a flat-screen satellite TV, and Club Floor benefits. Air-conditioned room comes with a flat-screen satellite TV and a minibar. Guests can request the preferred bed configuration in the Special Request Box at the time of booking. Please note that the bed configuration is not guaranteed and will be confirmed upon arrival, subject to availability. 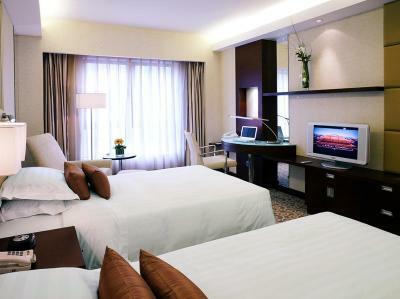 Guests are requested to inform the hotel of their bed-type preference in advance, subject to availability upon check-in. Room includes 2 single beds, a flat-screen TV with cable/satellite channels and a minibar. Featuring a seating area, this suite features a cable TV, air conditioning and mini-bar. Stay at the unique Crowne Plaza Beijing hotel for a central location on Wangfujing Street and easy access to Beijing's business district. Step from the bustling Wangfujing Street into the soaring, 9-storey atrium of Crowne Plaza Beijing's Lobby, where you'll be greeted by our friendly Front Desk staff. You can refresh with coffee and check email with complimentary wireless Internet on our sumptuous, leather sofas or settle into your calming room or Suite. Feel the pulse of the city from your central location on Wangfujing Steet, a short walk from Beijing's international banking and shopping districts. It's 45 minutes' drive to Crowne Plaza Beijing from Beijing International Airport and you're just 8 minutes' walk from Wangfujing subway station. Stroll 15 minutes to the mighty Forbidden City, Beijing's vast, imperial network of wooden temples and palaces, and a UNESCO World Heritage Site. The tempting Beijing roast duck is a favourite in our Xiao Wang Fu restaurant, while we import succulent Australian beef for our Angus Grill. Invite up to 300 people to banquets or conferences in our elegant Grand Ballroom, where our Crowne Meetings Director will see to every detail. House Rules Crowne Plaza Beijing Wangfujing takes special requests – add in the next step! A CNY1000 damage deposit is required on arrival (around USD149.14). This deposit will be fully refunded 7 days after check-out, as long as there isn't any damage to the property. One older child or adult is charged CNY 402 per person per night in an extra bed. Crowne Plaza Beijing Wangfujing accepts these cards and reserves the right to temporarily hold an amount prior to arrival. This hotel is a little bit old and the rooms are not fresh. And a breakfast is very poor for this price. Service and personnel are perfect. Worn down room, lack of ac, gym and spa area very run down. I can accept and older style decor if it were maintain but chipped formic all over room, peeling wall paper, tv from the 90’s and even at that line through the screen. Hotel a little dated Dont take great wall bus tours, its an all day trip and you only end up spending 1.5 hours on the wall, the rest are in tourist trap shops you get taken too. Air Conditioning was nearly non-existent. Not sure if there is a heat season and air conditioning season, and we happened to be in the heat season time. Room was overly hot and couldn’t cool down. Older rooms, at this hotel.